Let me present the new split release (FCKSPL 017), recorded by 2 Hungarian bands: Royal Hungarian Noisemakers & Stigmatic Destruction! 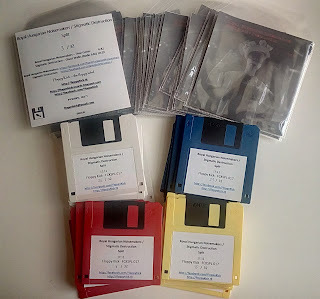 Limited to 32 hand-numbered copies only on colorful diskettes: 8 red (1-8), 8 yellow (9-16), 8 blue (17-24) and 8 white (25-32). Please specify the color you want to get! Quick Reply - RE: Floppy Kick presents: Royal Hungarian Noisemakers / Stigmatic Destruction split!